Have you stopped smiling because of exhaustion, headache, and moodiness? If you and your bed partner are losing sleep, ask Dr. Ollech about obstructive sleep apnea (OSA). OSA is a sleep-breathing condition that occurs when a patient’s airway is periodically restricted during the night. There are many possible causes for this blockage, including improper jaw position during sleep, enlarged tongue, tonsils or adenoids, and excessive relaxation of throat muscles. Whatever the cause, the effect is that those with sleep apnea stop breathing for 10 seconds or more at a time. Sleep apnea sufferers wake up countless times throughout the night and make snoring, choking, and gasping sounds as they sleep. Eventually, the brain will signal a sleeper to awaken, and he or she will do so abruptly, but usually not completely enough to remember the episode by the morning. Left untreated, sleep apnea can lead to daytime drowsiness, short-term memory loss, high blood pressure, stroke, heart attack, diabetes, and many other health issues. Any of the below symptoms might be indicative of sleep apnea. If you are experiencing these symptoms regularly, come see Dr. Ollech for an assessment. Traditionally, a CPAP (Continuous Positive Airway Pressure) machine is prescribed for people diagnosed with sleep apnea. While this device is effective if used properly, its bulk and accompanying facemask can prove too unwieldy or uncomfortable for the average patient. Dr. Ollech can prescribe an alternative treatment using an oral appliance which sleep apnea patients wear during sleep. This custom-fabricated appliance will ensure proper jaw and tongue position and keep your airway open throughout the night. Your oral appliance will be convenient, portable, and effective. It requires little maintenance and will make a significant difference in your quality of life. If you have sleep apnea, an oral appliance can restore the deep, uninterrupted REM sleep you may be living without. 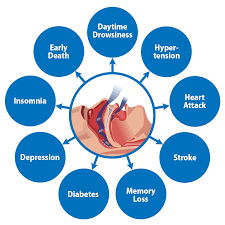 Don’t ignore the signs of sleep apnea! Being diagnosed and treated is easier than you might think. To start the process, call us today to schedule an appointment with Dr. Ollech. If indicated, she can administer a home sleep test or refer you to a sleep lab, and if it proves necessary, provide a custom oral appliance that will allow you to sleep deeply and without interruption. If you’re ready to finally get the rest that you need, be sure to contact us at Sleep Solutions of Rockland.